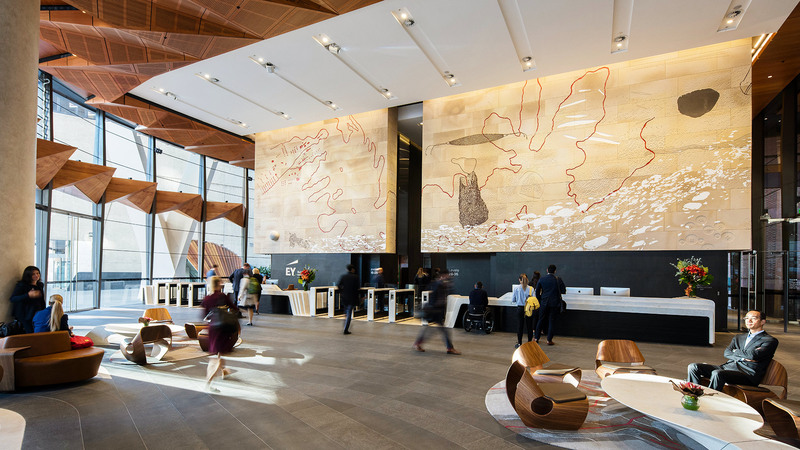 Richly layered with historical imagery, Watson’s artwork forms a quietly monumental backdrop to the EY Centre commercial foyer. The sandstone, excavated from the site itself, has been carved and painted with narrative motifs developed closely with Gadigal elder Uncle Allen Madden. 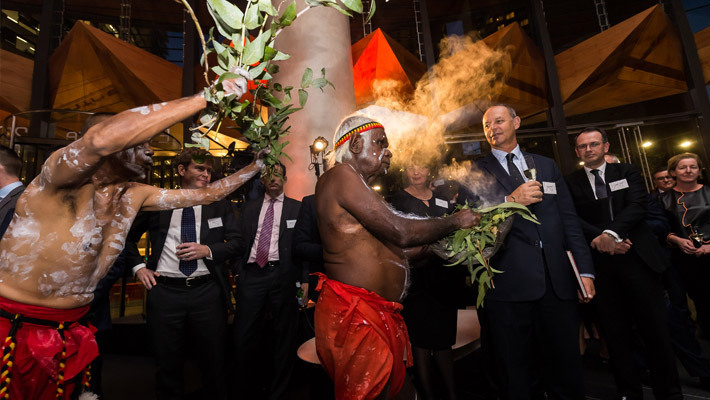 These illustrate the relationship of the indigenous Eora community with the local environment, from pre-European Settlement to the present, tying the new built fabric intrinsically to its physical and temporal place. 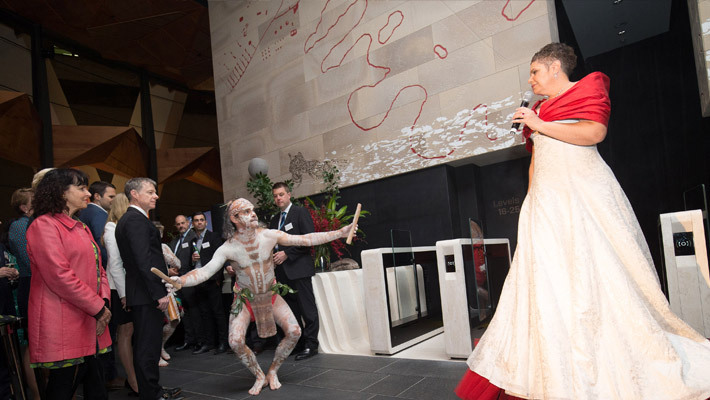 Straddling the site of the original Tank Stream, Watson explores multifarious notions of water, a theme which she feels a deep connection to - her mother’s family being from the Waanyi Aboriginal language group of North West Queensland, also known as ‘running water’ people. 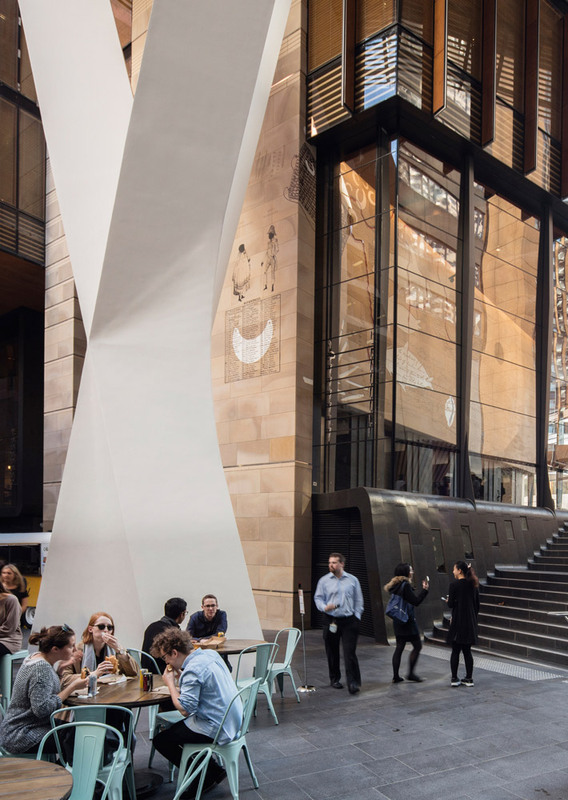 fjmt was integrally involved in the procurement of the public art across the 200 George Street site, outlining guiding principles for several artwork opportunities within the DA and Public Art Strategy Reports. 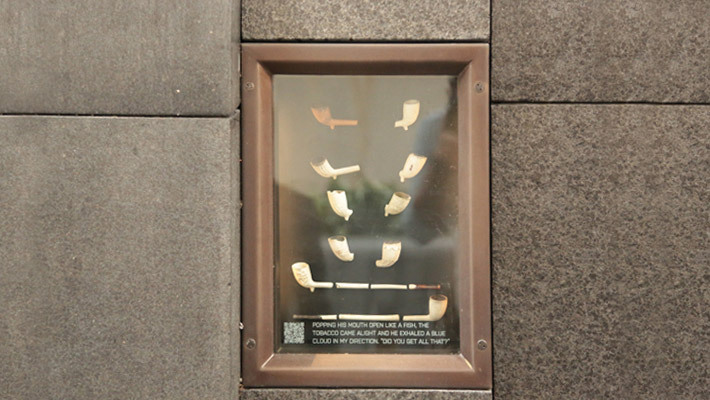 These were developed in collaboration with the client Mirvac and expert curator Hetti Perkins, within the framework of the City of Sydney’s public art obectives. fjmt also prepared the art strategy and brief for the Dalley Street laneway artwork - which was to be contemporary, transient and vibrant in nature - and were involved in structuring the competitive process through which the preferred artist was appointed. Site-specificity was a core principle outlined by fjmt for the major foyer artwork, intended to assist in the community’s understanding of the history of the site and its environs. We prepared the Artist Appraisals, from which Judy Watson was appointed, by invitation, from a shortlist of five indigenous artists. We were also responsible for preparing the detailed Artwork Brief, which formed the framework for the ten-month long Concept Design, Detailed Design, fabrication and installation process. Throughout this phase, Watson worked closely with Urban Art Projects. Watson’s artwork is integrally linked to this place through its manifestations of the site’s natural, and physical, history. 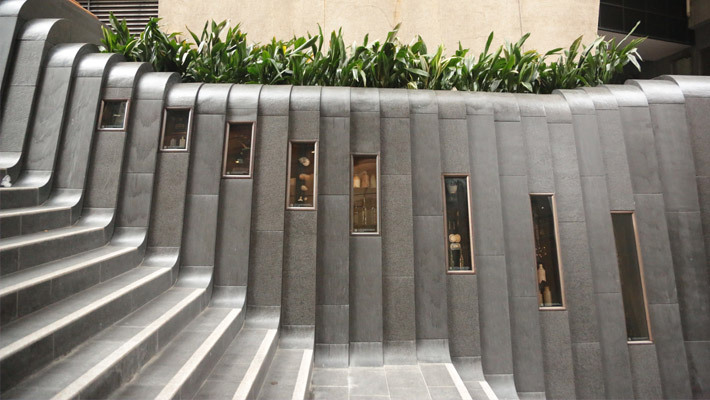 The artwork is composed of roughly 400 sandstone blocks, sourced from the site and finished and routed at Gosford Quarries. The quality ot the stone was so high that each block took in the order of six to eight hours to complete. 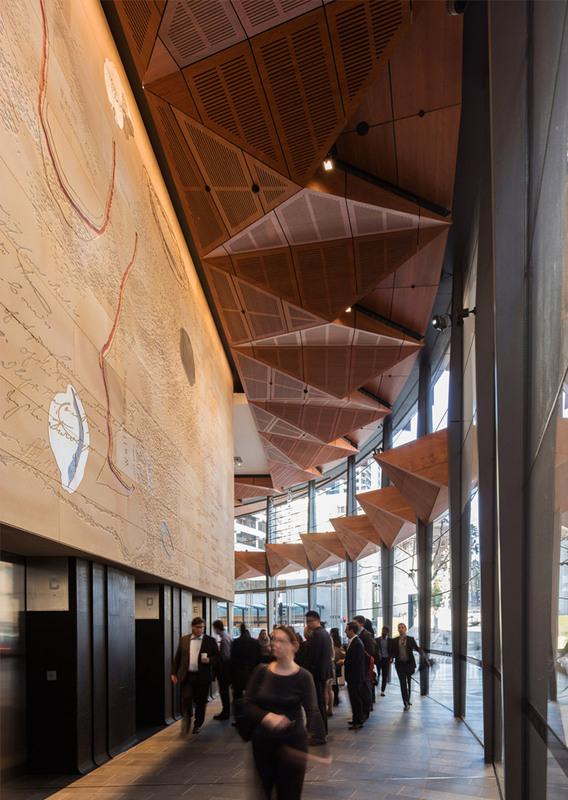 The delicate indentations of an enlarged water wash/etching by Watson tie the 300sqm piece together as it wraps seamlessly around four elevations of the lift core. Watson extends the notion of water into the night-time experience of the artwork, with fluid light projections shifting across the surface of the sandstone, reflecting the Tank Stream below. 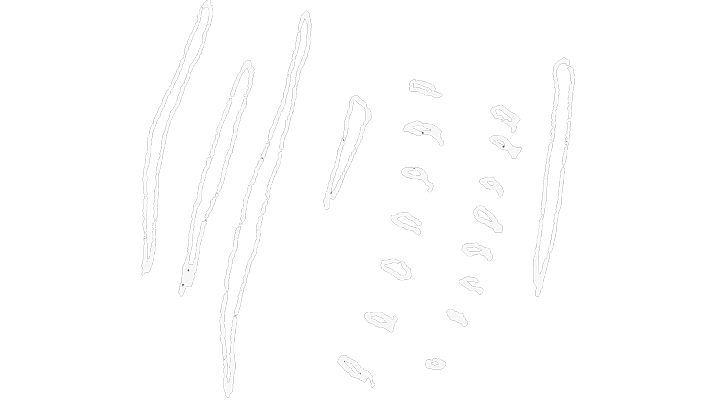 Gadigal words pertaining to water have been engraved into the sandstone, alongside their english translations. 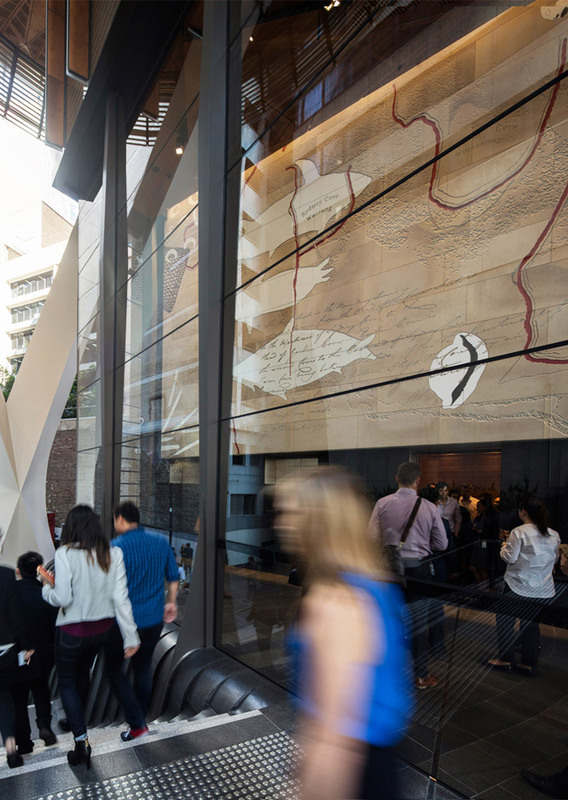 Artefacts depicting the indigenous, European and Chinese histories of the site have been superimposed, many of these meticulously hand-painted by Watson over the engraved sandstone surface. 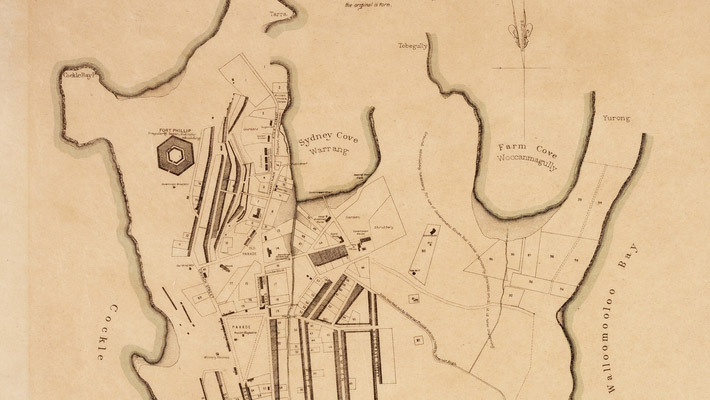 Developed representationally with graphic designer Madeline Critchley, dilly-bags and necklaces, significant historical inhabitants of the area, and extracts from post-settlement documents have been depicted in a dark ochre. Sourced from prominent museum collections around the world, Watson notes that the process of including these in the artwork is a form of ‘cultural retrieval’. 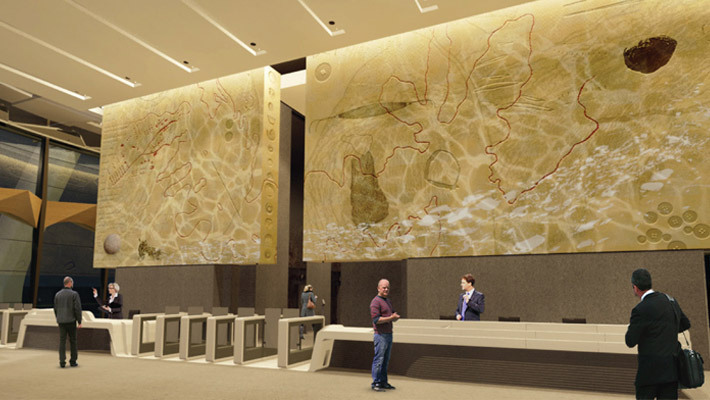 The amorphous outlines of the two wells uncovered on-site are also included, artefacts from which are on permanent display adjacent the Lobby. 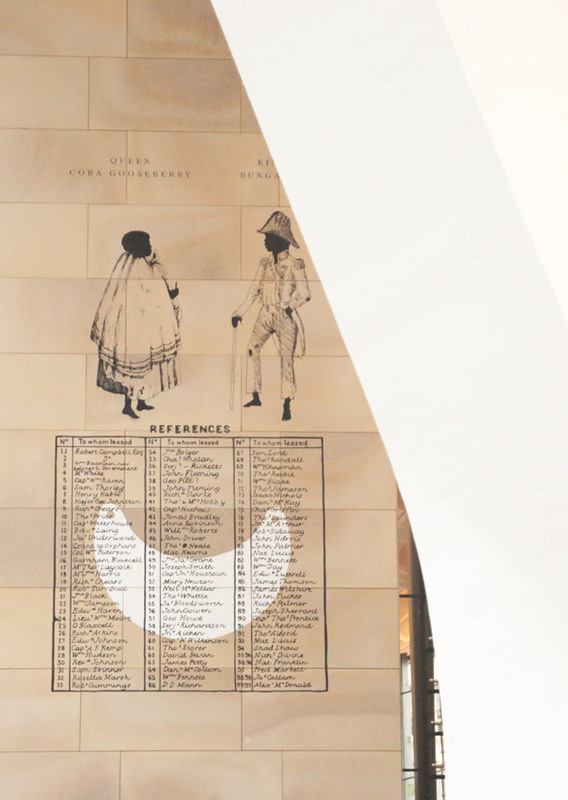 Diametrically opposite one of the well outlines is a representation of a large, smooth granite stone in proud relief, also retrieved from the site during construction. 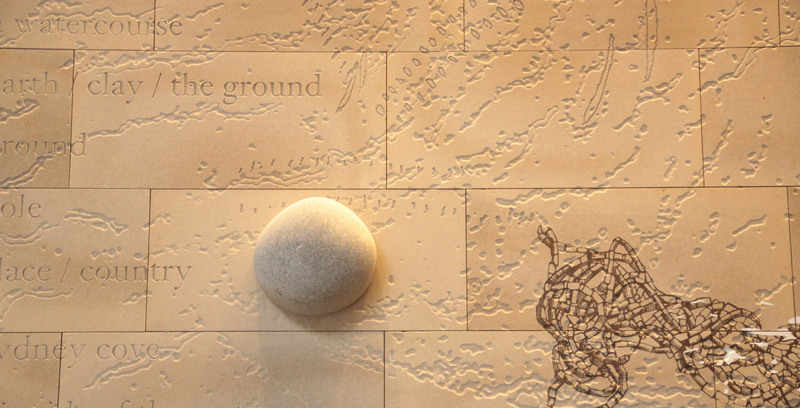 In Watson’s words, early maps of the Shoreline have been ‘incised into the stone’, and articulated in a vibrant red hue, echoing the process of scarification which is a recurring theme across the artwork. Like scarification, Watson’s artwork is not a transient piece, but forms an enduring part of the physical fabric of the new building. Metaphorically, this is similar to her observation that indigenous heritage persists through the physical fabric of early colonial buildings, which incorporated into their mortar lime from collected Aboriginal shell middens. These middens, depicted in a glowing irridescent white pigment, float ethereally across this watery, layered dreamscape.